This Summer has sent the priestly ordination of two men from England and Wales in the Fraternity of St Peter: Fr Matthew Goddard, at the FSSP seminary in Denton, Nebraska (USA), and Fr William Barker, at the seminary at Wigratzbad in Bavaria. With a group of ten lay people, who included Leo Darroch, President of the Una Voce International, I traveled to see the ordinations at Wigratzbad, which took place on 27th June. Fr Barker was ordained, together with four French and German seminarians, in the large modern church which houses a shrine of Our Lady next to the Seminary. The church was packed to the doors, with about 1,000 people; I was told that it was a record for the number of visitors. We managed to squeeze ourselves into different parts of the church among the friends and relations of the ordinands, who included many young people and children. The procession into the church was truly impressive, with 65 priests, including Fraternity priests from all over the world, and priests of other traditional orders, and ranks and ranks of seminarians. The ordination was celebrated by Bishop Athanasius Schneider, an auxiliary bishop in Kazakhstan (of German extraction) who has recently become well known for his book ‘Dominus est’ (Amazon), arguing for the reception of communion kneeling and on the tongue. This was the first traditional ordination I have attended, and I was very struck by the great beauty and solemnity of the ceremonies. It was a deeply moving and joyful occasion, remarkable for the number of priests present who all laid their hands, in turn, on the ordinands. The Solemn Mass was accompanied by Gregorian Chant sung with great dignity by the seminarians. The newly ordained priests were detained by crowds of people seeking their blessing; I was privileged to be blessed by Fr Barker. Leo Darroch and I were invited to the lunch put on for the clergy and the ordinands’ families by the Fraternity in the seminary, where I was able to chat with Fr Conrad Loewenstein FSSP, who is based in Venice, and is one of the sons of our Honorary President, Prince Rupert Loewenstein. The following day, together with Fr Armand de Malleray and Fr Simon Leworthy, the FSSP priests who serve the traditional community in Reading, we attended Fr Barker’s first Mass in an exquisite Baroque parish church a short distance from Wigratzbad. Nothing more eloquently expresses the progress of the restoration of the Church’s traditions than these ordinations, both for the world in general and for this country in particular. 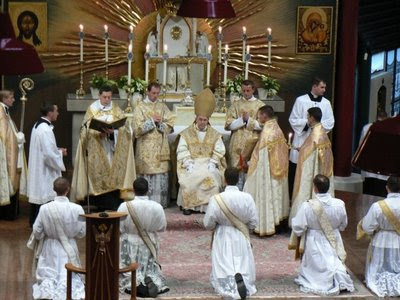 The Fraternity of St Peter and the Institute of Christ the King have not found England and Wales a barren mission field in terms of vocations, and many more such ordinations can be expected in the coming years. In the meantime the Latin Mass Society will continue to help these young men financially; anyone wishing to contribute to this can make a donation to the Latin Mass Society specifically for that purpose. I would like to thank Mr Mark Miles for his highly efficient organization of the trip, and to the FSSP for its kind hospitality. Isn't this brilliant? This is pretty well exactly what I'd like to do here in the UK. In fact I've already made a small start, with the St Catherine's Trust Chant course. What the video shows is the potential. Having argued that we may legitimately use the term 'Traditionalism' and its cognates (Traditionalist etc.) I should say what I think it means. A Traditionalist is a Catholic who wishes to live in organic continuity with previous generations of Catholics. Given the huge changes in the Church over the last half century such a desire, if it is serious, implies a serious and sustained effort. In the past much less effort, if any, was required of ordinary Catholics to live in organic continuity with previous generations of Catholics. And everyone could be assumed to want to live like that. The most obvious application of this desire is in the liturgy. The Novus Ordo Missae promulgated in 1969 is in organic continuity with previous editions, and the broad liturgical tradition, only in a sense which is thinner, more attenuated, than the sense in which the Missal of 1962, or the Missal of Trent, or any other pre-62 edition, is in organic continuity with its predecessors. I think I can say that without fear of contradiction. The Holy Father has made this point more forcefully but I will leave it at that. Saying just this explains why Traditionalists are 'attached to the previous liturgical tradition', as it is sometimes expressed (in the Motu Proprio, for example). The Traditionalist attitude towards continuity with the past has other implications. Rubricarius says we have something in common with the liberals. True: like them we reject Ultramontanism, the position which emphasises Papal authority (or more broadly the authority of the Holy See) over other sources of authority and information, such as Scripture, Tradition, and Councils. As I see it Liberalism replaces Ultramontanism with an inconsistent view of what we should take most seriously as Catholics. It places Vatican II at the heart of things; yet VII only has authority as a General Council, so it is inconsistent to emphasise VII at the expense of other Geneal Councils. Using (one interpretation of) VII to reject VI and Trent, for example, just doesn't make sense. Liberals and Conservatives have something in common, it seems to me: a disinclination to make distinctions between different levels of authority in post-conciliar Church statements. Liberals reject them all (as they see fit) without distinctioin, and Conservatives regard them all as equally binding. This is broad-brush stuff. But I've noticed Conservatives get very impatient with Trads when we point out, for example, that various positions are merely the private opinions of recent Popes, or have not been properly promulgated, or only come from a dicastery etc.. Of course this impatience follows from Ultramontanism. Like many trads I used to be a Conservative, so when I talk about or criticise Conservativism I am in part talking about my own former self. I can see now that I used to want to live in organic continuity with previous generations of Catholics, but within the limts set by Ultramontanism. So, because this or that had been approved (note: approved, not declared infallible) by recent Popes, I thought I ought to go along with it. When I finally saw the error of Ultramontanism, my traditionalist instinct was able to develop more fully. The error of Ultramontanism is easy to see, with hindsight, because it is rejected not only by Liberals and Trads but also by the Pope and the Papal Magisterium. In the chaotic decades which have followed the Council, Papal teaching has often been a lifeline for Catholics who wanted to see traditional teachings reiterated; it is natural that Conservatives have clung on to it. It is understandable, but obviously wrong, to take this to an extreme and start saying that whatever the Pope, or some Vatican department, makes a friendly off-the-cuff remark about must be imposed on everyone by next Tuesday, and the Popes themselves would regard this attitude as absurd. Hence we find a frequent contrast between what Popes have said about their own positions, and how Conservatives have applied those positions. So Paul VI said that Natural Family Planning can be legitimate in certain circumstances. And you get Catholics who regard themselves as Conservative saying that all Catholics preparing for marriage should be drilled in it. John-Paul II said that the Luminous Mysteries of the Rosary might be found helpful, and Conservative presses suddenly pulp all their books on the Rosary so they could add the new mysteries, and conservative parishes insist on having them. Benedict XVI carefully explains that his books are not papal teaching, but his opinions as a private doctor, but Conservatives promote them without such a warning and they are printed wrapped in the papal colours. I'm not saying these applications are wrong. But they illustrate the attempts of Conservatives to be - as the phrase has it - more Catholic than the Pope. If you listen to the Popes you get a complex and nuanced view of Papal authority; if you listen to Conservatives, too often you do not. Why do people attack 'Traditionalists'? James Preece of Catholic and Loving It, and Jackie Parkes of Catholic Mom of 10, have recently been having a go at Traditionalists. I admire both blogs but I feel I should address the issue, although they have both toned down (or deleted) the most stident aspects of their posts. Is is wrong or un-Catholic to use labels for sub-groups of Catholics? No, of course not; people have always done it, and the magisterium has frequently helped itself to such terms, or invented new ones. We've had Gallicans, Modernists, Integrists, Ultramontanists, Cisaplinists, the pro-Imperial and pro-Papal parties and so forth. If you refuse to use the terms you won't get very far. What usually happens is that, being Catholics, the people in a party claim that the committments of the party are compatible with the faith, and are even implied by it in the concrete circumstances in which they live. If they couldn't claim that, they'd have to leave either the party or the Church, so this is hardly surprising. The problem is that the other side of the coin is that they imply that Catholics not of their party are less faithful to the implications of the faith, are less fully Catholic. So Catholic monarchists and Catholic socialists are often convinced that monarchism or socialism is, in the world we live in, implied by Catholic principles. Good luck to them, I say; this attitude needn't lead to bitterness or recrimination, and we can't stop them saying this if we want to have a debate about what Catholic principles imply for the world we live in. And obviously we have to have that debate. So today liberals, conservatives and trads all have views on what Catholicism demands in the 21st Century, and they think members of the other parties are mistaken. Is this a terrible thing? Not in itself. Now pay attention: If you believe something, you believe it is true. If you believe it is true, you believe people who disagree with you are wrong, and that they hold false opinions. This isn't wickedness, it is logic. It doesn't mean you think you are infalliible. It needn't imply an aggressive attitude towards people who sincerely disagree. James and Jackie seem upset by the implication, when trads do or say something, that non-trads have got it wrong. Lighten up, guys: your opinions have the same implication - that other people are wrong in the implications they draw from the faith. The attitude of liberals and conservatives could equally be described as suggesting trads have got it all wrong. And remember, trads have been the underdog in this three-cornered debate for 40 years; they are the ones who'se 'legitimate aspirations' (as John-Paul II called them) have been trodden underfoot. We don't have any power - we are just trying to survive. And we've been loyal supporters of many causes promoted by conservatives, a point I made a while ago when Daphne MacLeod accused us of being too concerned about the liturgy. So it is upsetting when these conservative commentators turn their fire on us. Attack your enemies, James and Jackie - not your friends. The LMS AGM was today. This was followed by lunch for the Committee and local LMS Representatives (and some guests), and a Pontifical High Mass in Westminster Cathedral celebrated by Bishop Arnold. Fr Andrew Wadsworth, a long-standing friend of the LMS who is soon to depart for the United States to work for ICEL, was Assistant Priest; Fr Martin Edwards, who was the guest speaker at the AGM, was subdeacon; the deacon was the Rev Mr Ian McDole, a deacon. The Westminster choir sang a Duruflé Mass. Worth noting in the last two pictures is the absence, not only of the temporary altar, but of the platform which it used to sit on. 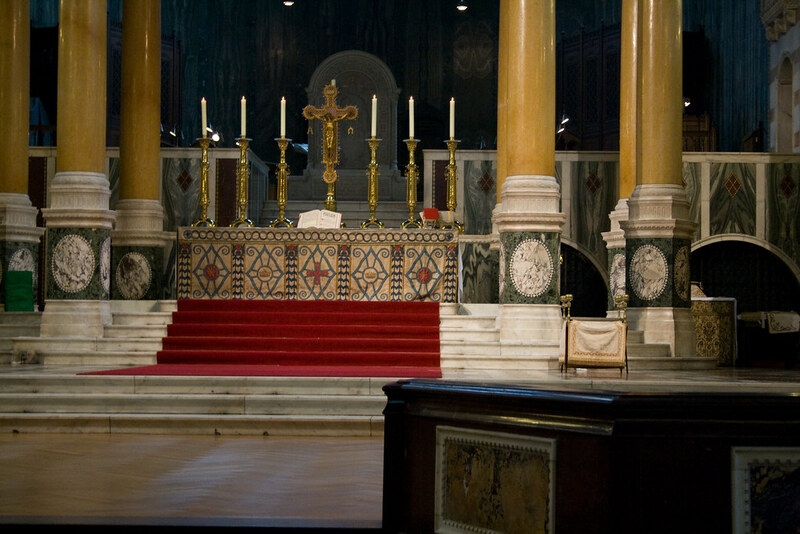 The platform used to stay even when the temporay altar was removed for the LMS's two annual Solemn Masses in the Cathedral. It hid the middle part of the bottom three marble steps (the uncarpeted ones) to create a larger space at that level. 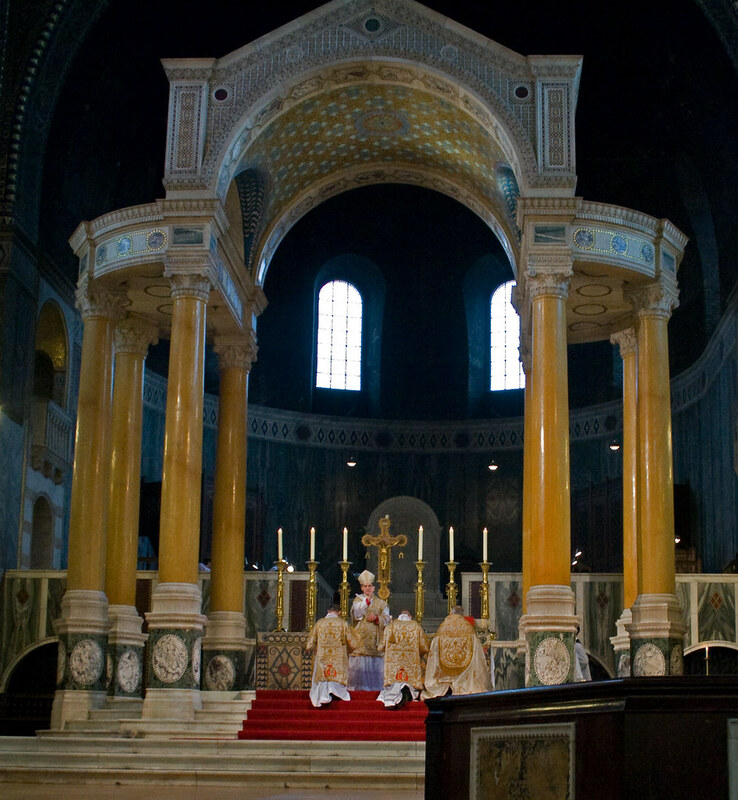 It has now gone forever, because Archbishop Nichols has permanently ejected the temporary altar. Novus Ordo Masses now use the high altar, which can be used without difficulty from both sides - as the installation Mass showed. You see the layout more clearly here, in a photo taken after Mass today ended. I'm just setting off for the AGM, but I've been sent this: a long-planned gradine, for the candles to go on, has now been completed for the Fraternity of St Peter. The picture also includes a new set of candlesticks and altar cross from Luzar Vestments. Mass was for the Sacred Heart of Jesus yesterday. Every now and then I post up dates for the Traditional Catholic Family Alliance, which meets in Ware and in Reading. I took some nice photos of the Mass last Saturday at the Ware event, which is the last before before the Summer break. The Ware meetings in particular are well structured, with four age-group-based classes of children and adults all having suitable talks or activities while Fr Andrew Southwell sees each group (including, usually, the adults) for catechesis. TCFA meetings are wonderful opportunities for Catholic families to meet up and offer each other mutual encouragement and support, in the context of the traditional liturgy, catechesis from a priest, and a set of talks and activities. 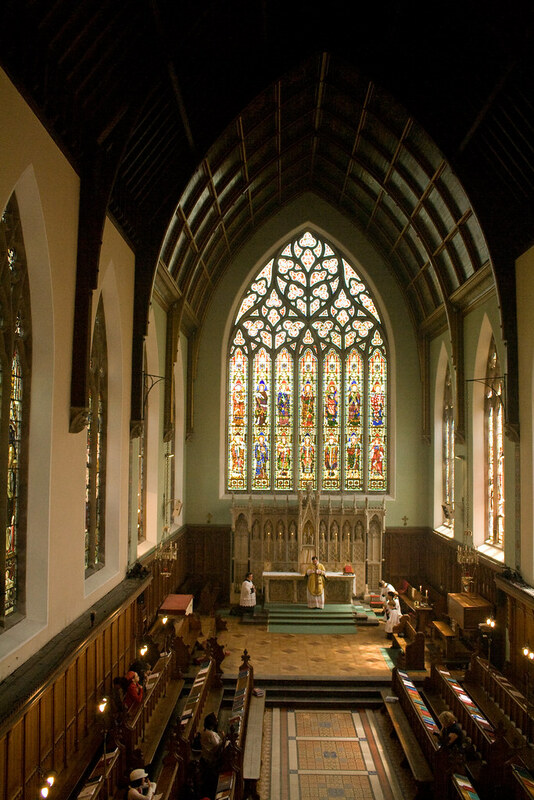 At Ware the Masses are always sung, and take place in the stunning Pugin chapel. I encourage families who have not experienced the TCFA events to come along. Not only are you missing out, if you don't come, but the organisation of these events is hard work and they need your support. 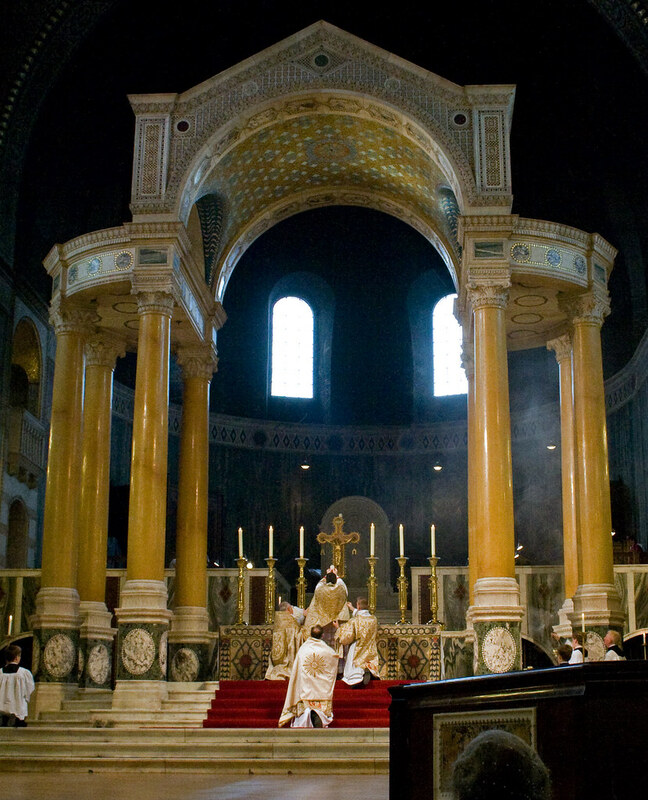 We celebrated Corpus Christi in style in Oxford, with a traditional Missa Cantata on the Thursday and a big procession of the Blessed Sacrament on the Sunday. 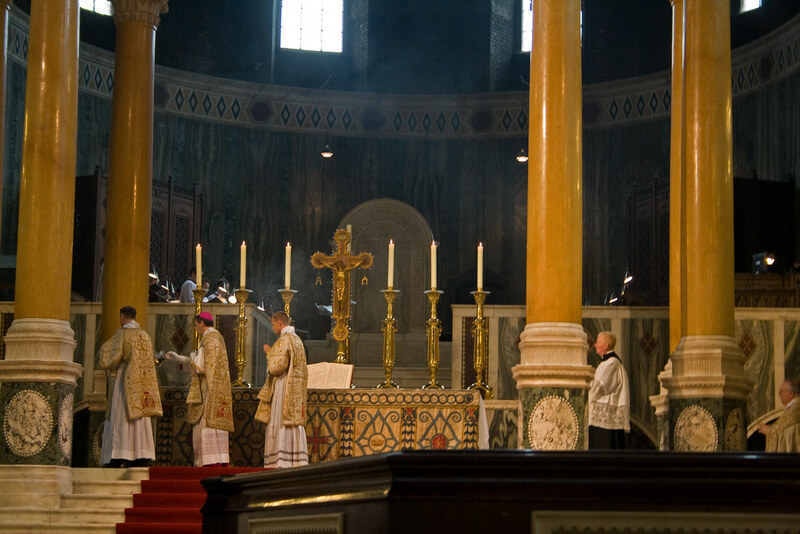 Mass on the Thursday, in the Oxford Oratory, was accompanied by the Schola Abelis, and reported here. For more photos of the Mass see here. 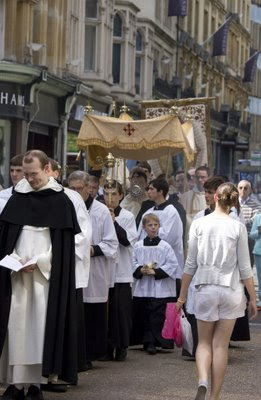 There are some excellent photographs of the procession, like this one, by Br Lawrence Lew here. 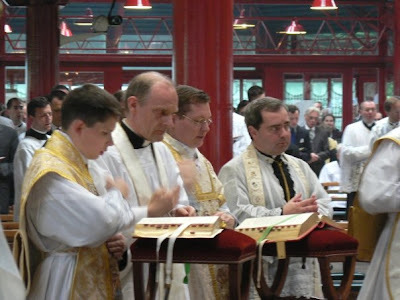 On Sunday the newly ordained Fr Matthew Goddard FSSP celebrated Solemn Mass in Reading. Fr Goddard taught in the St Catherine's Trust Summer School in 2006; his father, a convert Anglican clergyman, is the priest custodian of the Shrine of Our Lady of Consolation of West Grinstead (Sussex), which the Summer School visited that year. 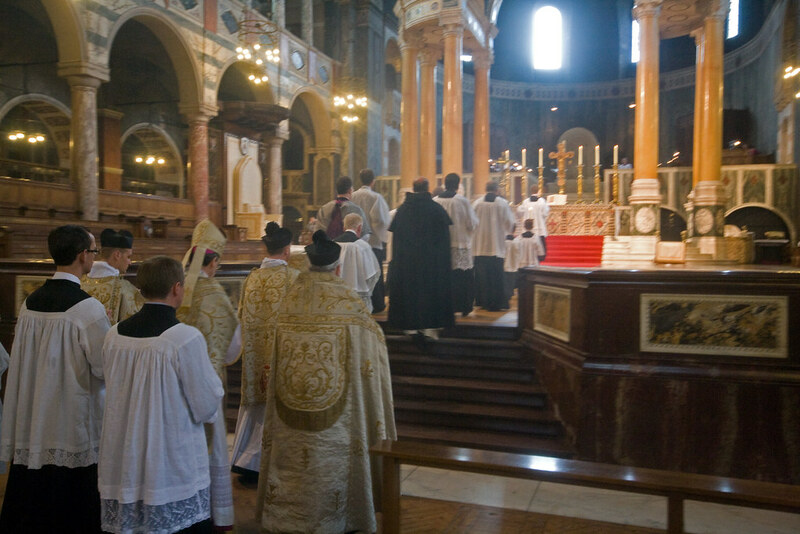 All British seminarians at the traditional orders are entitled to modest yearly subsidies from the Latin Mass Society, so we don't forget about them, even while they are studying abroad. I'd like to thank Christopher Bobabilla for lending me his camera for these photographs. See more of them here. 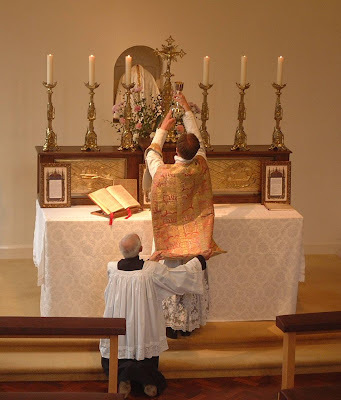 The Latin Mass Society of England and Wales (LMS), in association with the Archdiocese of Westminster, is organising a residential training conference for priests wishing to learn the Extraordinary Form of the Roman Rite (Traditional Latin Mass) at All Saints Pastoral Centre, London Colney, Herts, the premier conference centre of the Archdiocese of Westminster. 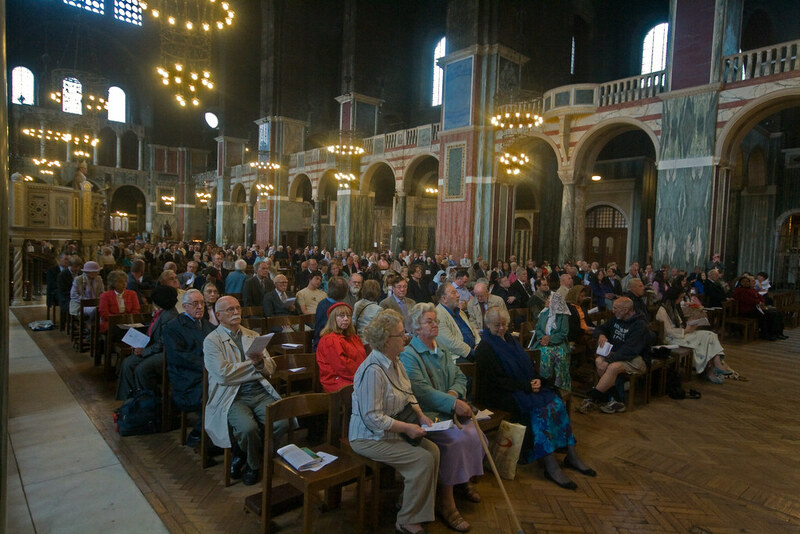 The conference will run from Monday 24 August to Friday 28 August 2009 and will feature Traditional liturgies in London Colney’s magnificent Ninian Comper-designed chapel together with a Gregorian Chant schola and polyphonic choir. Expert tuition in the celebration of Mass in the Usus Antiquior will be provided on a small group basis. There will be guest lecturers and all participants will receive 1962 Missals. As well as daily Sung Mass, devotions will include Lauds, Benediction and Rosary. The subsidised fee to participants is only £115.00 which includes full board and accommodation. Places are limited and priests are urged to register as soon as possible.